Personalize your Epic X with one of our new color and design options. Durable, water-resistant, stain-resistant and scratch-resistant to match the personality of your office. Epic X features innovations such as pre-initiated tips, laser-assisted whitening, and temporary relief of minor pain, all from a single diode laser solution. TMJ and pain relief – Exclusive to Epic X! Pre-initiated tips for maximum performance with minimum chair time – Exclusive to Epic X! Peace of mind, knowing you’re covered with a loaner Epic X unit within 24 hours should yours need service – Exclusive to Epic X! 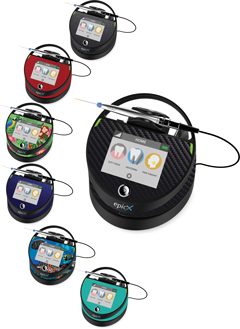 Epic X- the most versatile and complete diode laser for the whole dental team. Please call us today at 888.395.3056 or fill out the form to the right to trade-up to Epic X.
EPIC X not available in some countries. Learn more about Epic X! Fill out the form to download the Epic X brochure!